Paramount Packaging has announced the launch of an Alpha VII FW3710BS/B back seal flow-wrapper that has been adapted for reliable, high speed operation on the mobile field harvesting rigs widely used by fresh produce growers. Ideal for salad and vegetable growers in particular, Paramount Packaging’s flexible new flow-wrapper is mounted on a robust stainless steel support frame to ensure stability and rigidity when sitting on the harvesting rig. This key technical enhancement allows the flow-wrapper to be easily repositioned when the sides of the rig are folded up for transportation between fields and even countries. It also boasts an integrated ink jet coder and labeller. Specially developed for wet environments, the bespoke flow-wrapper features an ultra-hygienic design to help prevent dust and dirt accumulation, and offers easy access to the mechanical and electrical components. It meets full wash down requirements and incorporates water drainage channels from the infeed. 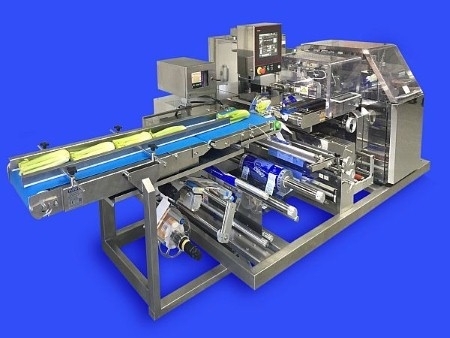 Paramount Packaging’s latest machine, which operates up to 120 packs per minute (ppm) with a low maintenance box motion sealing system, boasts a convenient ‘plug and play’ two-part infeed which allows it to be used with different types of rig and across a variety of applications. Offering fast changeover, the settings can also be stored on the front facing USB port and transferred to different machines for added flexibility. Simon Martin, Sales Manager at Paramount Packaging comments: “We have seen increasing demand for automated flow-wrappers that offer high speed yet accurate and reliable operation in harsh outdoor environments, and in all weather conditions. 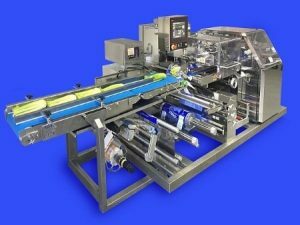 However, a standard flow-wrapper requires careful handling and positioning meaning it might not offer the performance and efficiency benefits required by today’s salad and vegetable growers. A 12” colour touch screen and multi lingual operator interface can be customised using images, words and illustrations for simplicity and fast and accurate diagnostics, and enables easy operation by foreign workers. The USB port facilitates machine back up and allows product data to be uploaded easily. Ideal for the overwrapping of irregular shaped, fragile or sticky products such as fish, sausages or IV bags, Fuji’s Alpha VII back seal flow-wrappers feature bottom film feeds for easy, positive transfer of product from the infeed conveyor to the film tube. The range is capable of operating at speeds up to 250 ppm, with a maximum film width of 650mm and cut off length of 430mm, and capable of handling products measuring up to 200mm (width) and 100mm (height). Paramount’s Alpha VII series offer energy saving technology, improved production efficiencies and reduced operating costs. The innovative Fuji Vision System (FVS) is integrated in to the film drive roller housing and helps ensure product integrity by checking film tracking, image and joints, label application and print legibility, as well as barcode verification and optical character recognition (OCR). Optional equipment such as film pre-creasing devices, labellers and hole cutters can be installed directly onto the wrapper. A non-contact fibre optic film run out switch makes threading film easier and also prevents marking. Paramount Packaging Systems Ltd is the exclusive distributor of Fuji Machinery Company’s horizontal and vertical form-fill-seal equipment in the UK and Ireland.